Jánský Vrch is situated in the town of Javorník in north Moravia on the border with Poland. 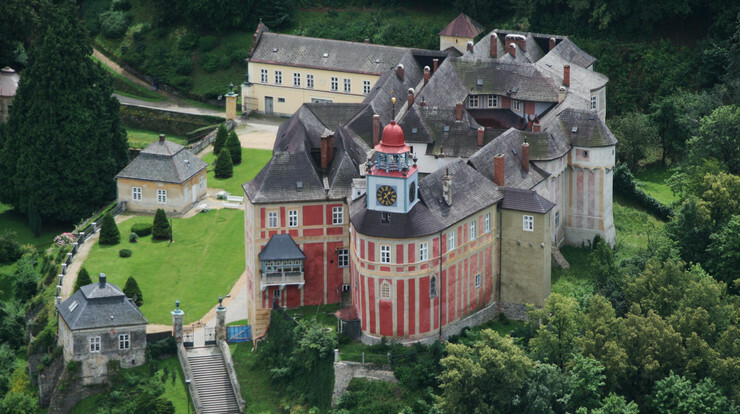 The first record of the castle dates back to 1307 when Prince Bolko I of Svidnice (Poland) is mentioned as its owner. His successor bestowed the castle upon the Vratislav bishops and it was used as their summer seat until 1945. The castle was gradually altered into a chateau. Currently 4 guided tours are offered. The first tour is to the state rooms and an exhibition of historic pipes, one of the biggest in the Czech Republic. The second is through the chateau’s utility areas: bathroom, kitchens, cook’s room, servants’ dining room, laundry room, ironing room, etc. The building has a very interesting shingle roof which still contains the original beams from the 15th to 19th centuries. Visitors can also go into the flanking tower, see the remains of the original Baroque facade and go into the attic room with a clock workings. On the third floor of the chateau are guest rooms with original furnishings. These consist of 8 smaller guest rooms, mostly studies with an adjacent bedroom. This guided tour is accompanied by an interesting exhibition every year. In 2014 a fourth guided tour was opened – through the chateau grounds.